HPANWO: Muslim Clerics- Are They Shills? The news, especially the tabloid press, has been raving about a proposed anti-war demonstration in the Wiltshire town of Wootton Bassett by the Muslim pressure group Islam4UK (http://www.islam4uk.com/) The town has become an unofficial gathering place for people to show their respects when the bodies of soldiers killed in Afghanistan are flown back home for their funerals. The protestors plan to carry mock-coffins themselves to represent the local Afghan Muslims who’ve fallen in the war. For this reason there are calls for the demonstration to be barred because it is inappropriate. The Sun has been predictably incensed, see: http://www.thesun.co.uk/sol/homepage/news/2791562/Fanatics-plan-march-in-Wootton-Bassett.html . 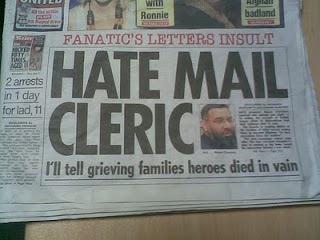 It has featured a front page article on a hard-line Islamic cleric called Anjem Choudrey who has been writing to the families of the dead soldiers telling them that their “sons died in vain”. The Sun calls him “Britain’s Most Hated Man“. This eerily echoes the case of “America’s Most Hated”, see: http://hpanwo.blogspot.com/2008/01/americas-most-hated.html . Experienced actor to play the role of an Evil Islamic Cleric in British government propaganda broadcasts and newspaper stories. Must be willing to wear false beards and be able-bodied enough to kneel down in the street. Must be able to take on a sinister-sounding name like “Mohammed Evil Al-Turban” or similar. I’m actually only half-joking. Every time one of these goons appears in the headlines the more convinced I am that these so-called “evil Muslims clerics” are paid government shills. You see, the Illuminati-occupied government of the UK want to start a civil war in Britain, a race war. A year or so ago David Icke had a meeting with a traffic warden who had been secretly trained to do routine police duties like arresting people and criminal investigation. The reason he was given when he asked why he was doing this training was that “there’s a war coming, and the police are going to be too busy fighting civil unrest to do their usual job”. Hospital security officers have also been given "pace cards", the powers of arrest and issuing on-the-spot fines. I’m not surprised because I can now see how the ingredients for this coming war are being deliberately mixed together and the fuse is being primed. Why would the government actually want a war; you might think. Well it’s a Divide-and-Rule ploy. When we’re fighting Muslims (Didn’t it used to be the Jews who were the hated scapegoats? Who will it be next; the Buddhists, the Moonies, the Divine Light Missionaries?) we won’t be fighting the Illuminati; it’s that simple. It’s a trick that has been used before. As long as we’re slogging it out with each other we’re controllable because the powers-that-be will be sitting above the fray, pulling the strings of both sides and knowing that while attention is focused on our internal conflict we will be oblivious to our rulers. Along with Problem-Reaction-Solution and Stepping-Stones, Divide-and-Rule is the most popular political manipulation tool in the world. It has kept us in chains since the rise of the Illuminati at the beginning of history. It was for the Divide-and-Rule strategy that King Charles II, and his forbears and successors, organized the Plantation of Ulster in which, over a period of a century, 40,000 Scottish and English Protestants were moved into the land that would later become Northern Ireland and split the indigenous nation of Ireland in two. This has resulted in hatred and carnage that has endured to the present day. The English Kings did not move the Protestants into Ulster and give them privileges over the native Catholic majority because they were “their kind of people”; they did it because they knew that the Catholics would resent it and begin attacking the Protestants. The Protestants would fight back and warfare would ensue. And all this time the English rulers would be able to dominate both sides. The result was that British rule in Ireland persisted for the next 300 years. These Divide-and-Rule ploys will continue to be used on us… until they stop working. It’s also about Problem-Reaction-Solution too. A civil war will make everyone not directly involved beg the government to intervene and bring it to an end; this will inevitably mean harsher laws: curfews, CCTV vans, martial law etc, like you see in the film V for Vendetta. Policies that would today cause public outrage would be passed through Parliament on the nod, and even be demanded by the populace. Shots have yet to be fired in earnest, but this process has already begun. 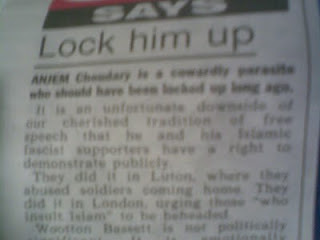 See the bottom picture, The Sun’s editorial talks of “the unfortunate downside of our cherished tradition free speech”. Solution? End free speech by banning Islam4UK and halting the demonstration. Once it’s been applied to Islam4UK, the foot is in the door for it to be used elsewhere on other people, and eventually on everybody. Maybe sanity is finally prevailing over official cowardice and political correctness- Islam4UK has been banned. Well, Chris, I think that's terrible! I'm not a Muslim and don't agree with everything Islam4UK stands for. And I'd hate to live under Sharia Law. But once we withold free speech from one group of people, we effectivly give licence to the authorities to take it away from ALL OF US. It's the foot in the door they seek, the thin end of the wedge. "Every time one of these goons appears in the headlines the more convinced I am that these so-called “evil Muslims clerics” are paid government shills." Yup. Check whatreallyhappened.com about "fake al quaida actors"
FRANK COLLIN was a major figure in the National Socialist Party of America - until his Jewish heritage was revealed. DANIEL BURROS, a Jewish American, became the major recruiter for the most violent Klan group that existed - the United Klans of America. When his Jewish identity was made public in a New York Times article, he committed suicide. HAL TURNER -- paid by FBI.